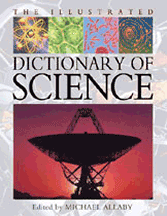 A well-organized dictionary of science covering all the major scientific disciplines: physics, chemistry, biology, ecology, medicine and physiology, and the Earth sciences. Its entries also explain terms belonging to the history of science and include brief biographies of important scientists. Diagrams and artworks illustrate key concepts of science. The lavishly illustrated entries explaining such topics as the solar system, plant evolution, skeletons and muscles, or geological time scale are a unique feature of this dictionary.